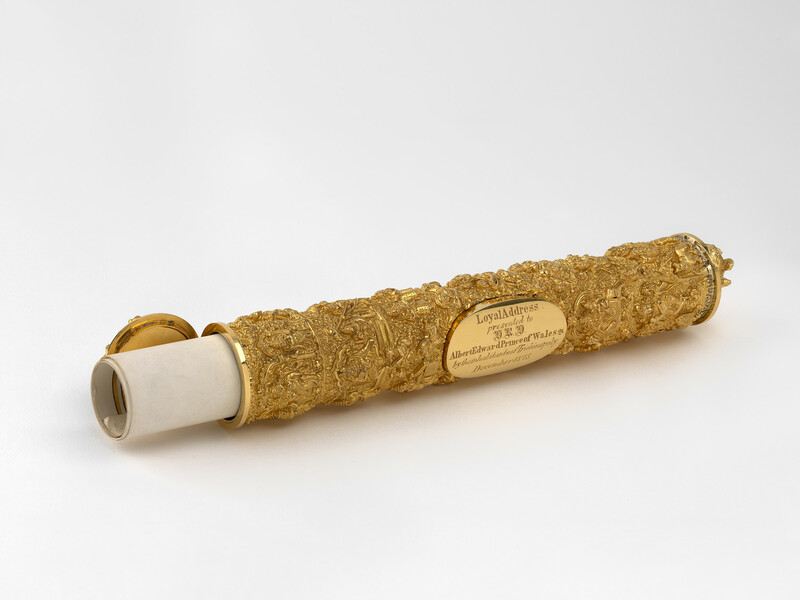 A gold cylindrical address case made of sheet gold worked in high repousse depicting Hindu gods such as Ganesh, Shiva and the avatars of Vishnu. The sculptural cap of the scroll case depicts the Hindu god Vishnu reclining on Adishesha, a five-headed serpent. The other end of the case shows a man on horseback. Depictions of Hindu gods and goddesses, popularly known as swami (god), in gold or silver were usually worn as amulets or used to embellish ritual objects. The increased European presence in India in the latter half of the nineteenth century and demand of objects of 'traditional' Indian design encouraged Indian metalworkers to apply these motifs to objects of European form and use, such as tea sets and cases. Craftsmen from Trichinopoly were renowned for producing swami-decorated objects in gold. The address, written in English on parchment, to the Prince of Wales is decorated with a gold foliate border. A watercolour of the 'Trichinopoly Rock', a seventh century temple dedicated to an avatar of the Hindu god Ganesh, is affixed to the address.